General Motors will launch its all-new 2020 Chevrolet Silverado 2500HD and 3500HD pickup trucks next year with a bold design, updated engines and an all-new 10-speed Allison transmission. The new heavy-duty pickups also feature an incorporated step on the side of the box, just behind the cab, to allow easier access into the bed. The 2020 Silverado 2500-3500HD will offer increased maximum towing and payload capacity compared with current models, according to GM. The automaker promised its truck will top the heavy-duty pickup class in trailering capability. The trucks follow the design language seen on prototypes underdoing snow testing in February and a teaser image released by Chevrolet in April. The 2020 Silverado HD will debut in February 2019, likely making its first public appearance at the Chicago Auto Show. It will go on sale in mid-2019. Trucks.com had the opportunity to view an early mock-up of the 2020 Silverado 2500HD in November. In person, the truck is extremely large, with a domineering front fascia and tall cabin. It features an extra three inches of rear legroom compared with the current Silverado HD. The stamped “Chevrolet” badging across the chrome front bar commands attention, and an aggressive hood scoop is carried over from the current heavy-duty truck. However, the initial shock soon wears off. Around the side and rear of the truck the Silverado HD adopts classic Chevy lines and proportions. Its rear window, taillights and tailgate are reminiscent of the current Silverado 1500 as well as previous generations of Chevrolet trucks. The Silverado 2500HD and 3500HD trucks will include an all-new 10-speed Allison transmission. Bedsteps on the side of the bed improve access to the fifth-wheel trailer hitch, Chevy says. The large vehicles include "Chevrolet" stamped across the chrome front bar. The sides of the bed are tall, creating a high shoulder line that adds to the truck’s dramatic presence. But the bed floor is relatively shallow so anyone reaching in can still access things inside. Chevrolet also enlarged the steps on the rear bumper and added integrated side steps, called Bedsteps, on each side. Chevy says the Bedstep improves access to the fifth-wheel trailer hitch for owners towing heavy loads. The Silverado HD comes on the heels of the all new light-duty Silverado 1500, which debuted earlier this year. The trucks share some styling cues but little else – the only sheet metal used by both models is the roof. The Silverado 2500-3500HD further sets itself apart under the hood. GM will introduce an all-new direct-injected gasoline engine in the new Silverado HD, replacing a 6.0-liter V8 engine with 360 horsepower and 380 pound-feet of torque. The new engine will be mated to a six-speed automatic transmission. Also available is the 6.6-liter turbodiesel Duramax V8 currently available on GM heavy-duty trucks with 445 horsepower and 910 pound-feet of torque. New for the 2020 Silverado 2500-3500HD is a 10-speed Allison automatic transmission that will pair with all Duramax engines. Chevrolet did not reveal maximum towing or payload figures. However, it did note that the new Silverado HD will have increased capabilities and trailering technology. The new Silverado 1500 offers towing features such as trailering menu pages, trailer-theft alert, a backup hitch camera and remote brake light check that may provide hints at what to expect from the upcoming Silverado HD. Heavy-duty trucks are vital to GM’s truck portfolio. They are preferred at construction sites and other commercial and industrial professions for their strength, toughness and reliability on the job. The Silverado 1500 and Silverado HD models combined for almost 519,000 in sales through the first 11 months of 2018, trailing only the Ford F-Series, with sales of almost 822,000 units, as the top-selling vehicles in the U.S. Sales of the Chevrolet Silverado 1500-3500 are level so far this year compared with the same period a year earlier. 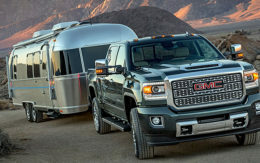 The Silverado HD will also heavily influence the upscale GMC Sierra HD, expected to debut in the near future. Fellas the new style is so ugly, please fire the design team they are heading In in the wrong direction with this style I’m in the market for a new truck and I’m not buying this truck I’m going to keep what I have . Love the Chevy family but it’s time to look to keep what we have. I am a Chevy person. The 2019 Silverado looks good, but the 2020 Silverado is down right ugly. The headlights are in the wrong place. I am glad I got a 2014 Silverado. I will not need a truck for awhile. What have we done to deserve this? Chevy and gmc had been getting better looking with each new model until this. Makes me want to throw up. How can i mock my friends with fords when you have just re created the edsel. I really hope this is a joke, because well, it is! Horrible. Who designs these things??? Looks like the old ford. 6’x8’ sheet of plywood going down the road. What happened to the aerodynamic’s??? Been a Chevy man my whole life even sold them. Like the looks of the 1/2 ton but the HD is a pile of crap. Guess it’s time to change. Looks damn good. Bravo Chevy. I’ll be trading my 2018 HD 3500 for a 2020.
released.. ala Duramax please.. Awesome looking HD Chevy.. Keep it coming.. This looks amazing. I think the haters are still paying on the ones they already have. People always justify what they’ve done to their wallets by hating what is new. This is the best looking Silverado they have made. I was waiting for the 2020 hoping it would look like it’s little brother 1500. Bummed. Very bummed. High Country looks awesome. Just wish they’d do something with that bazooka tail pipe on the Duramax!